In 1845, the Lancet medical journal published a scathing editorial regarding the 100-year old Glass Tax in Britain . The shift towards fewer and smaller windows, to which the glass tax contributed, was having noticeable health effects for those spending more and more time indoors due to industrialization. Not long after, researchers began studying the bactericidal effects of sunlight [2–4]; quickly realizing the importance of the capacity for sunlight to control pathogenic bacteria, particularly in health care facilities [5, 6]. Since 1877, a large body of research has been conducted on the effect of sunlight [7, 8], ultraviolet light [9–13], and other wavelengths [14–17] on mono-cultured bacterial survival and activity. Human physiology and health fields have explored the effect of sunlight on skin [18, 19], and architects use daylight as a design element to shape space as well as positively impact comfort, energy use and experience of the space [20, 21]. Even with this history of light-based studies, there has been, to our knowledge, no research conducted on the effect of light on the indoor microbial community. The microbial community found indoors is primarily sourced by outdoor air and microbial occupants [22–24]. Many infectious organisms persist indoors for months [25–27], potentially creating a reservoir that may be spread via direct or indirect contact . The presence of microbial cells and cell components can even enhance the allergic reaction of individuals to pet allergens . The building itself, including the materials found indoors and how spaces are used, can determine whether microorganisms survive or perish, remain or are carried away, and whether our methods of cleaning for microbial control is effective . 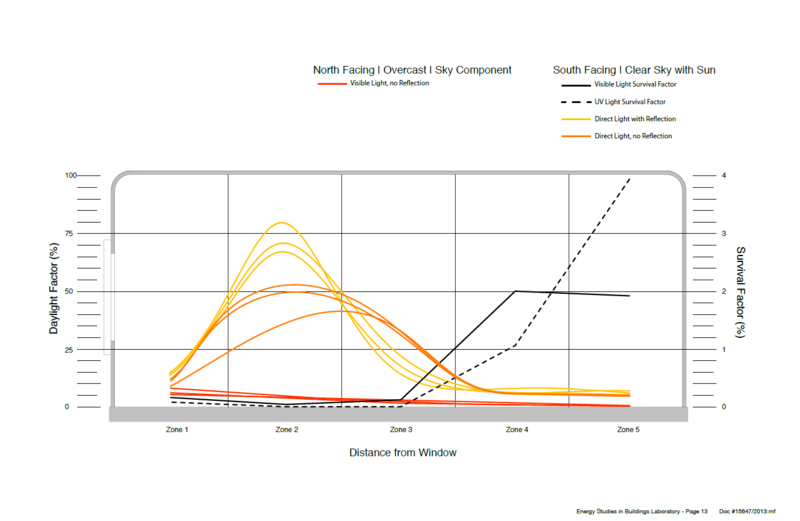 The inclusion of windows, the use of different light filters on glass, shading strategies, and outdoor weather conditions can impact the amount and spectra of light which finds its way indoors, and thus how much daylight the indoor microbial community is exposed to (Figure 1). In the wake of these uncertainties about the indoor effects of light on bacteria, BioBE conducted two pilot studies, one with Pseudomonas aeruginosa colonies and the other with house dust. First, we created “microcosms”, scale structures that would mimic the window size and daylight exposure of a typic office, while maintaining a typical temperature and humidity that one would find in an office setting. We then placed Pseudomonas aeruginosa (“Pseudo”) bacterial cultures on agar plates inside these contained “microcosms” for a day of total darkness, or natural circadian rhythms of visible light or UV only. Fifteen plates were placed on a gridded pattern in each microcosm to discern spatial patterns of daylight, illumination levels and bacterial survival relevant to architectural space. 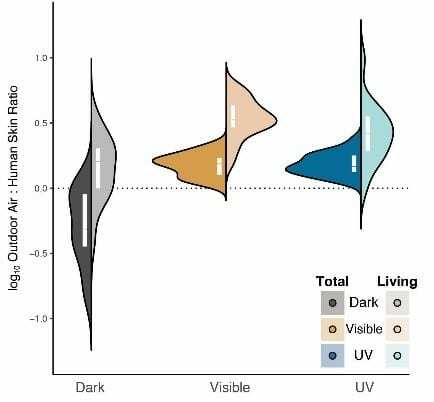 After a day of treatment, Pseudo colonies that received either light treatment had fewer and smaller colonies of growth than the Pseudo that remained in the dark, and survival was inversely proportionate to how much visible or UV light the Pseudo culture plates were exposed to (Fig. 2). For our second study, we used homogenized house dust to conduct a very similar process, but for 90 days. The findings remained consistent, with the amount of light inversely proportional to bacterial growth (Fig. 3). 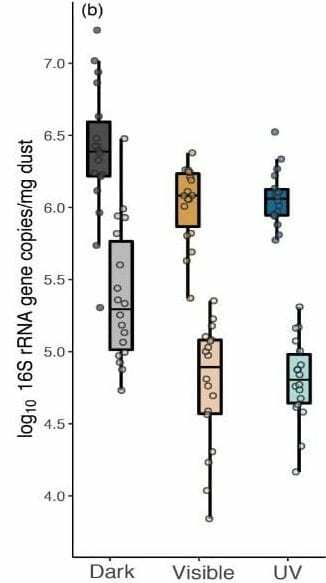 Moreover, the dust that received a light treatment contained more bacteria which were “outdoor-associated” than the dust in the dark, which contained more human-associated bacteria (Fig. 4). This study has been accepted for publication, and is available online from Microbiome. While our studies were only preliminary, it opens the doors for more research into the effects of light on the indoor microbiome. There are basic questions which remain to be answered: how quickly does different lighting affect microbial community structure? Is microbial diversity uniformly reduced or do specific taxa survive and thrive? Will inactivated (but surviving) microorganisms grow back at night or when artificial lights are off? Further research into this practically untouched body of study may provide key insight into building design, lighting, and into the improvement of human health. To read our publication, click here. NPR’s coverage of our study is also out, check it out here. The Duty on Glass. Lancet 1845, 45:214–216. Bazzoni CB: Am. J. Public Health 1914, 4:975–992. Ward HM: Lancet 1893, 141:383. Downing AMW, Blunt TP: Proc. R. Soc. Lond. 1878, 26:488–500. Medeiros AB de A, Enders BC, Lira ALBDC: Esc. Anna Nery 2015, 19:518–524. Nightingale F: Notes on Hospitals. Longman, Green, Longman, Roberts, and Green; 1863. Hessling M, Spellerberg B, Hoenes K: FEMS Microbiol. Lett. 2017, 364. Fonseca MJ, Tavares F: Am. Biol. Teach. 2011, 73:548–552. Besaratinia A, Yoon J-I, Schroeder C, et al. : FASEB J. 2011, 25:3079–3091. Goldman RP, Travisano M: Evolution 2011, 65:3486–3498. Takada A, Matsushita K, Horioka S, et al. : BMC Oral Health 2017, 17:96. Dai T, Vrahas MS, Murray CK, Hamblin MR: Expert Rev. Anti. Infect. Ther. 2012, 10:185–195. Oppezzo OJ: J. Photochem. Photobiol. B 2012, 115:58–62. de Sousa DL, Lima RA, Zanin IC, et al. : PLoS One 2015, 10:e0131941. Maclean M, Anderson JG, MacGregor SJ, et al. : J Blood Transfus 2016, 2016:2920514. Deng Y, Yao J, Wang X, et al. : PLoS One 2012, 7:e39704. Ondrusch N, Kreft J: PLoS One 2011, 6:e16151. Patra V, Byrne SN, Wolf P: Front. Microbiol. 2016, 7:1235. Prescott SL, Larcombe D-L, Logan AC, et al. : World Allergy Organ. J. 2017, 10:29. Himmelfarb P, Scott A, Thayer PS: Appl. Microbiol. 1970, 19:1013–1014. Lax S, Smith DP, Hampton-Marcell J, et al. : Science 2014, 345:1048–1052. Prussin AJ 2nd, Marr LC: Microbiome 2015, 3:78. Adams RI, Bhangar S, Pasut W, et al. : PLoS One 2015, 10:e0128022. Otter JA, French GL: J. Clin. Microbiol. 2009, 47:205–207. Kramer A, Schwebke I, Kampf G: BMC Infect. Dis. 2006, 6:130. Smith SM, Eng RH, Padberg FT Jr: J. Med. 1996, 27:293–302. Hübner N-O, Hübner C, Kramer A, Assadian O: Am. J. Nurs. 2011, 111:30–4; quiz 35–6. Herre J, Grönlund H, Brooks H, et al. : J. Immunol. 2013, 191:1529–1535. Maclean M, Macgregor SJ, Anderson JG, et al. : J. Photochem. Photobiol. B 2008, 92:180–184.